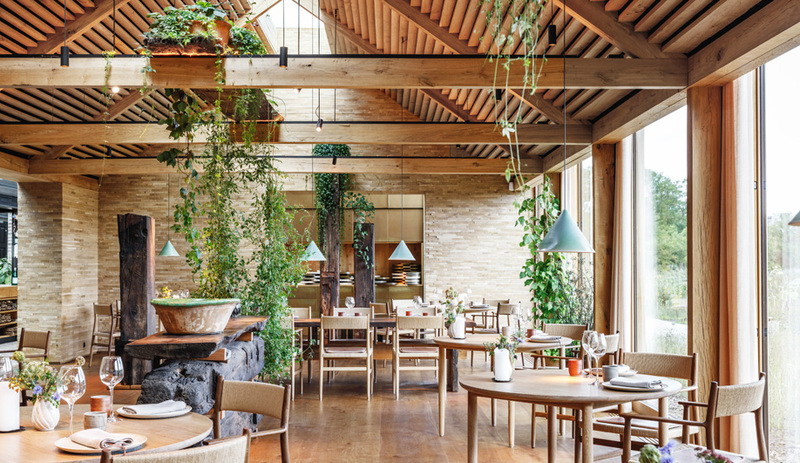 Hong Kong interdisciplinary firm openUU develops a restaurant – and a menu – that pairs its founders two loves: design and cuisine. 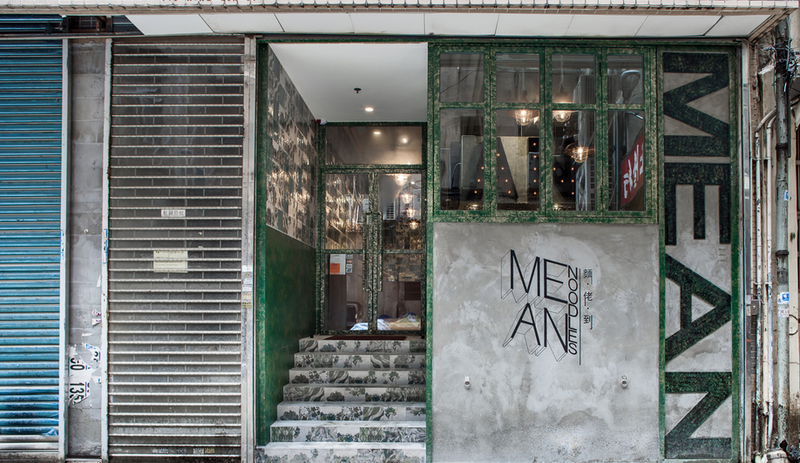 Along with slinging Southeast Asian street food, Mean Noodles also serves up interiors inspired by Malaysian Batik textile art. Architects come from myriad backgrounds. Tadao Ando, for instance, began his career as a boxer. Peter Zumthor was attracted to design through cabinet-making. Michel Rojkind spent his formative years in Mexican pop-rock band Aleks Syntek y La Gente Normal. And Kevin Lim, who heads up Hong Kong interdisciplinary firm openUU with partner Caroline Chou, spent his past life as a trained chef. That experience has largely laid dormant as openUU’s profile has risen. Since its founding in 2011, the firm has landed a number of high-profile commercial projects: it masterminded offices for fintech giant WeLab, designed Art Basel’s Hong Kong outpost and recently launched a flagship for Tokyo fashion label Ril Creed. When the time came for an owned-and-operated passion project, though, the duo returned to Lim’s first calling: food. 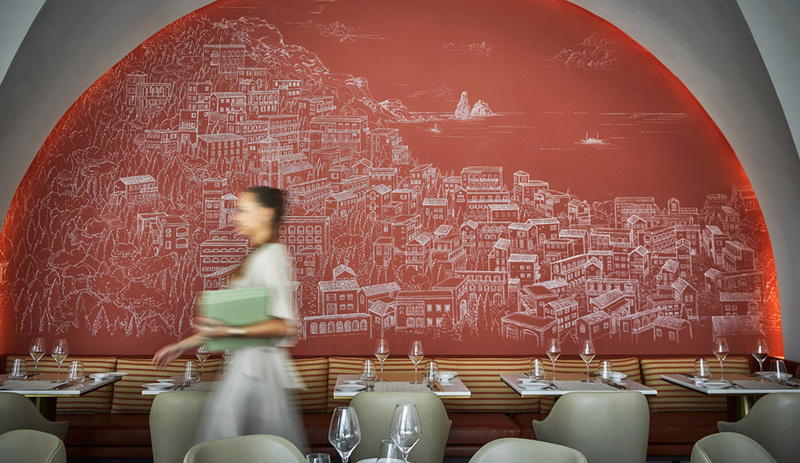 The firm developed the menu with a surprising collaborator: Ming Tsai, whose Massachussetts restaurants made him an American celebrity chef. 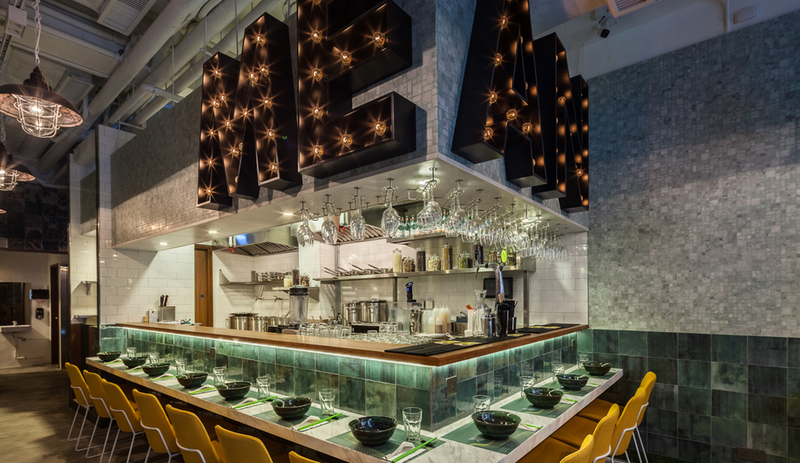 Tsai’s Blue Ginger, a fast-casual staple in the Boston region that operated for two decades, was one of Chou’s favourite restaurants while she studied architecture at Wellesley College. Lim, on the other hand, received culinary training from Boston’s Le Cordon Bleu. 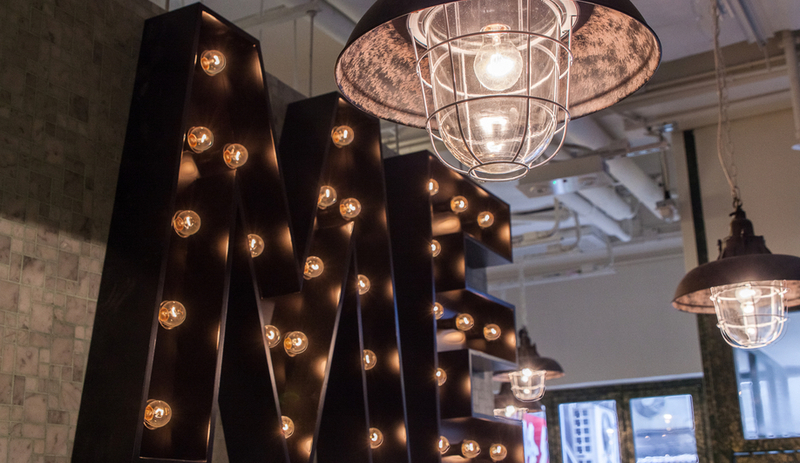 After climbing a staircase from street level, the first thing visitors notice in the 715-square-foot space is that big MEAN sign, made of letter lights mounted to custom cabinetry. 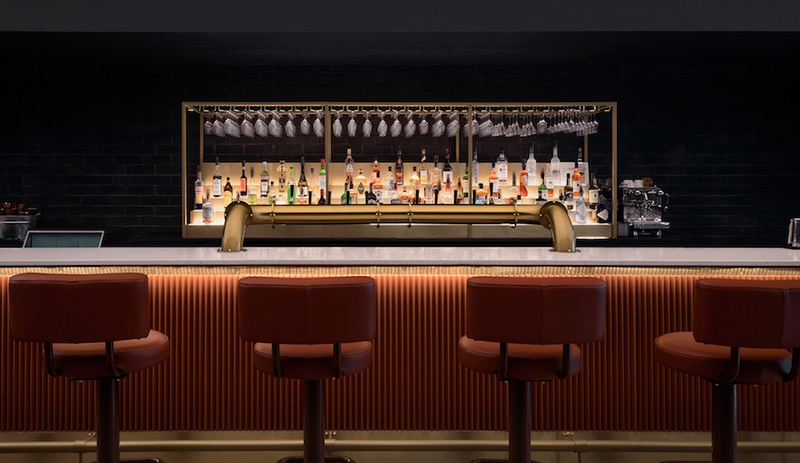 Diners are invited to sit at a bar that wraps around the open kitchen, which offers front-row views of dishes being prepared, or linger at the restaurant-length standing table (below). 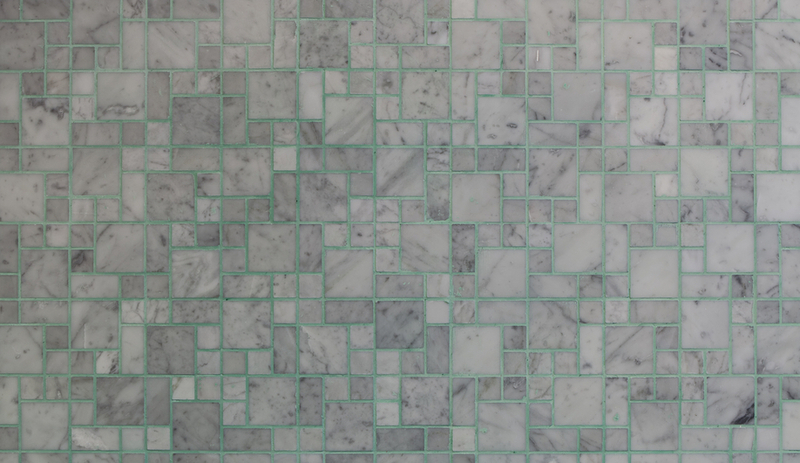 From there, the standout details – namely, the inventive tiling used throughout – emerge. 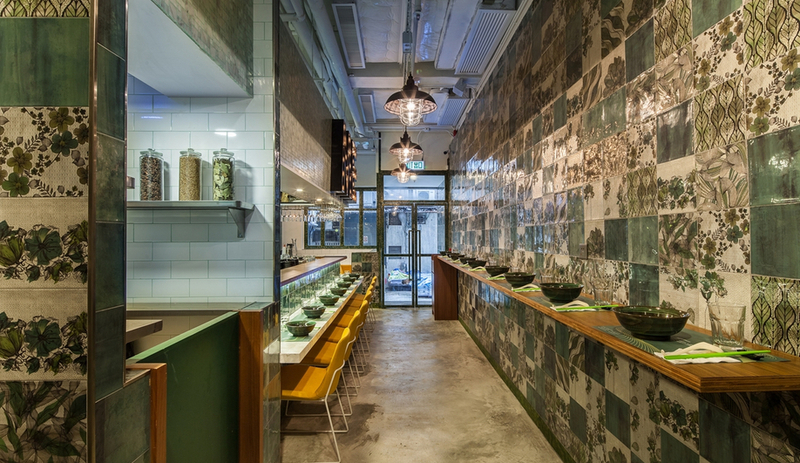 The restaurant’s ceramics are an exercise in branding, to be certain – a glimpse at Mean Noodles’ Instagram displays tableware bearing the restaurant’s insignia – but the tiled walls are also a tribute to Batik, the textile art of Malaysia that typically involves brush-painting colours and patterns on fabric. 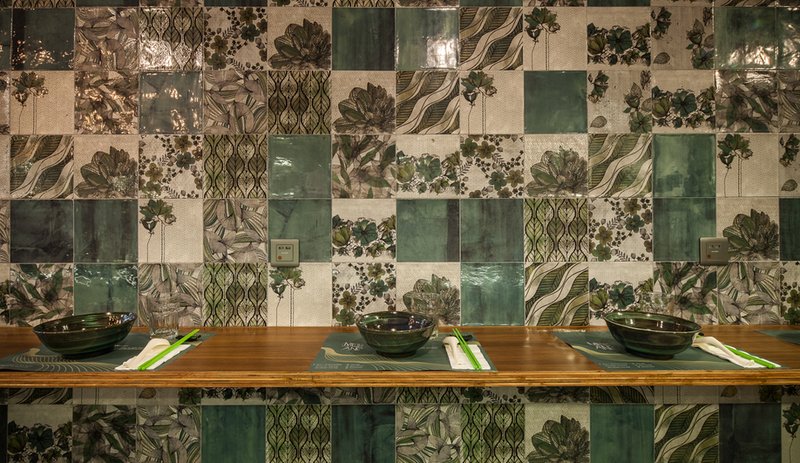 In fact, the restaurant’s ceramic walls look almost quilt like. Batik-style patterns even extend to the restaurant’s exterior, which includes steps defined by floral tiles. 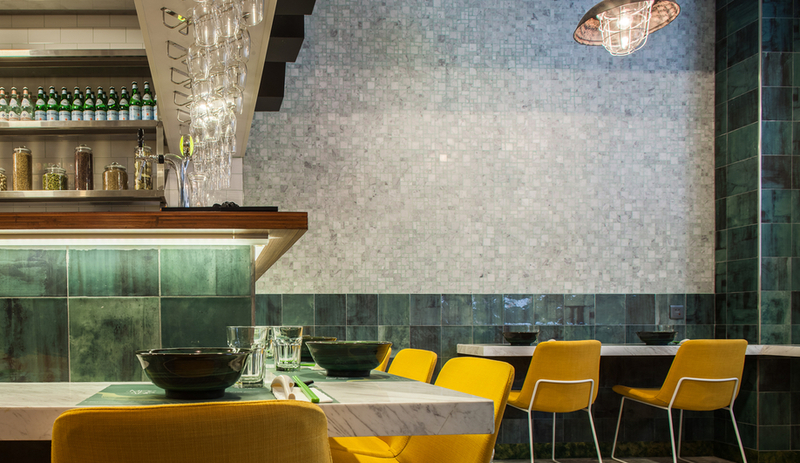 The eye-grabbing feature wall contrasts with materials used throughout: the wrap-around bar is made with marble; the polished concrete floors, vaulted ceilings and exposed ductwork hint at an industrial past; the mustard-coloured chairs add a pop of colour; and the subway tiles with teal grout, below, provide additional texture. 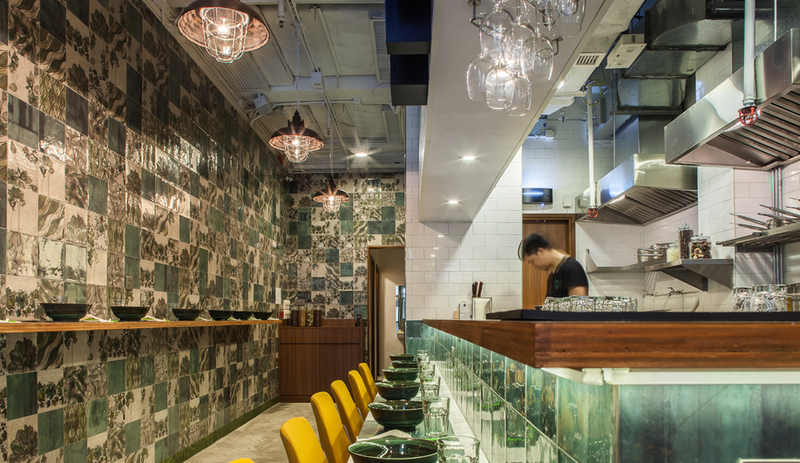 The attention to Mean Noodles’ design is also mirrored in its dishes, which aim to elevate hawker food, typically found in street-side stands or hole-in-the-wall joints. We’ll just let the photos – and our rumbling bellies – do the talking.